Landon is the grandson of the Director of Crush volleyball club. Landon was severely injured by his nanny's husband on June 30th and had to be air cared to Children's Hospital of Colorado. He was admitted to the PICU with a crushed skull and brain bleed. That was one month ago! 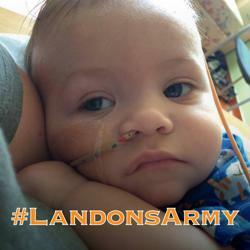 Landon and his parents have a long hard road ahead of them in the wake of this heinous act. The medical bills are piling up and he will need 24 hour care with special equipment and medication. Each team will have 3 men and 3 women with the option of an extra libero. Tournament play will begin at 9 am with check in at 8:30. The tournament will included pool play and bracket play. $20 per player to participate. Payment can be sent via paypal, mailed in, or turned in during check in the morning of the event. More details to follow. Email Brenda Smith at treasurer@crushvolleyball.com with questions.